Christendom College recently appointed Catherine Schneider as the new associate director of admissions. 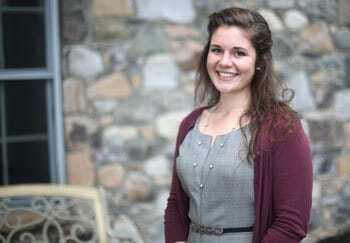 A member of Christendom’s graduating class of 2016, Schneider will bring her love of Christendom to a wealth of new admissions programs, as the office looks to expand its outreach to families looking for a time-tested, Catholic liberal arts program. “Catherine’s love of Christendom will enable her to impact the college and its constituents in numerous positive ways, and help prospective students and their families come to a deeper appreciation for the unique educational experience that we offer. I’m thrilled to have her join our team,” says vice president for enrollment Tom McFadden. A native of Louisiana, Schneider earned her B.A. in philosophy from Christendom this past May. While a student, she served the campus in a number of different leadership roles, including as a resident assistant, a member of the Philanthropy Board, and as a volunteer with the Student Activities Council. As the associate director of admissions, Schneider will be responsible for attending conferences, visiting schools and homeschool groups, and spearheading four distinct “grassroots” programs over the course of the year. The first two of these programs will seek to involve current parents and alumni in the recruiting and communicating process by asking them to “adopt” a local parish or school. As people who know the college best, and who value the Christendom educational experience the most, they will be excellent ambassadors for the college with the various schools and parishes. Schneider will be the point person for these ambassadors, and will work closely with them to help them achieve their goals. The third program, “Meet Christendom College” events, will involve a family inviting friends and other interested parties into their own home, so that they can give personal testimony to the effect that Christendom has had on their family. In some cases, a member of the admissions team will travel to the event, other times, a short informational DVD will be shown. The fourth program will involve social media, as Schneider encourages alumni, parents, and current students to share news about Christendom across Facebook, Twitter, Instagram, and more. “People are more interested in Christendom than ever before, as families eagerly seek out an authentic, Catholic education for their children that will help them achieve the greatness to which God is calling them and become the leaders this world so desperately needs. We’re excited to be undertaking these grassroots initiatives this year, and we are looking forward to collaborating more with the people who know Christendom best — the parents and alumni of the college — as we seek to spread their love, and our love, of the college to as many families as possible,” says director of admissions Sam Phillips. In her new role, Schneider succeeds Zac Inman, who served as the associate director of admissions for the college for the past four years. “Zac was instrumental in helping Christendom reach record enrollments year after year during his time at the college, and his humble spirit, his perseverance, and his tremendous character will be dearly missed. We wish him the best in his new adventure as a teacher in Ohio,” says McFadden.